I can't believe how quickly this year is flying by and I have to get into party planning mode as Kenzie's birthday (Christmas) is coming up. She loves bike day at school and some of her friends bring scooters so when the Rockboard Mini Scooter came for review, I knew that she would just be in awe. Rockboard Scooters give you the best of 2 worlds. Each scooter is equipped with advanced Rockboard Propulsion Technology which features a revolutionary steel power drive chain that tears up the pavement and keeps kids active and entertained with every up-and-down propel. If your kids want a much casual ride, kids can simply adjust the two-positioning locking joint and the Rockboard turns into a low-profile kick scooter for cruising. The Rockboard scooter is built to last, with an ultra-strong steel box frame and front fork, die-cast aluminum deck, and a rear spring enhanced suspension that creates the smoothest ride on unforgiving surfaces. Since Kenzie is a bit younger than the recommended age of 5 years old, we started off in the original kick scooter mode as well as put the handle down to the lowest setting. Although she was a pro and scooted away, she had to master gripping the brake as her hands are a wee bit small. She loves it though and once she gets a sturdy handle on cruising, she can try the unique rocking mode. I know she needs to put on her helmet but since we were just right in front of the house and I was right there, she was ok. The Rockboard Mini Scooter can hold up to 90 pounds so as much as I was tempted to try it myself, I refrained and will just have to wait another year for Kenzie to test it out. The concept is brilliant - you rock up and down on the base of scooter and in turn cruise down the street due to the advanced propulsion technology. If you want to go faster, just rock faster. This will be great when Kenzie has to walk to school because it is portable and compact - just a quick fold and you are golden. It has a handy kickstand that is perfect for when we cruise to the park and Kenzie hops off. Plus how can you not love the girly pink color? Let's just say that the neighborhood kids were curious and jealous of her new ride. The Rockboard Mini Scooter would be a fantastic gift for the holidays as it will be enjoyed for many years. Buy It: You can purchase the Rockboard Mini scooter for $132.58 + free shipping! Make sure to connect with Rockboard on Facebook and Twitter! One Winner will Receive a Rockboard Mini! I love that this is the smaller version. Perfect for my daughter who wants to be just like her big brother! I'd love to win this for her! I want it because I love the size and it would be perfect for my grandson! I like this for my son because it is a bit smaller than the bigger versions and he would have an easier time handling it and learning how to use it. This would be for my granddaughter. She's only 3, but she loves her scooter and with this one being smaller, it would be perfect for her. So neat! I would love this for my boys! I would love to win this for my son since they just opened up a board park a few blocks away from our home. I'd love to win for my 2 oldest... it looks like a lot of fun, and I think it'd be a great, fun new way for them to spend time outside being active. I would love to win this for my nephew b/c I think it's important to provide kids with toys that allow them to be physically active outdoors and that are not electronic. At 6yrs old, I know he would LOVE to ride this everyday! These are so cool, my oldest daughter we love to ride this!!! I would love to win this for my son to play with and get outside more. I want this because my daughter loves her razor scooter but I think she's ready for a challenge and this looks like the perfect thing for her! I would get this for my daughter and I love that this comes in pink so the girls can have fun too! This would be for my niece. I had a scooter as a kid and it was so much fun. This would be for my boys, I think this would be a great way to have fun outside and get exercise. 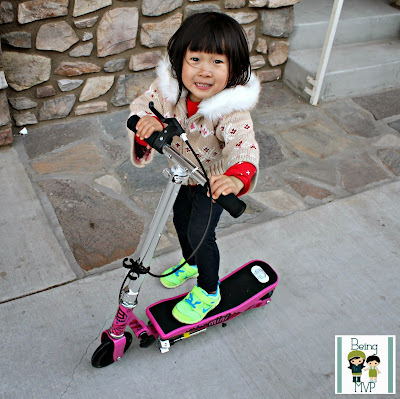 Dd has been asking for a scooter and this would be a perfect starter one! These look so fun and I am sure Brandon would love playing on thisl Great ideas for the season. I would love to win this for my niece because it would make me the best AUNTIE in the world! I would love to win this for my nephew. He loves to ride bikes and his skateboard. 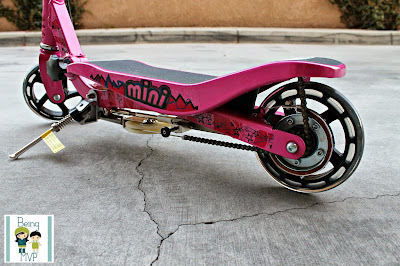 I want this for my neice, she loves her older cousins scooter! This would be for my niece. My kids would be too big for the mini one. My son loves to skateboard and would enjoy learning this. I Want This Because The Mini Size Is Perfect For My Niece! For Zylie because her brothers have scooters & she needs one her size for herself. I want this because it looks like it would be so much fun and it would be for my grandson. I want it because I love the size and it would be perfect for my son! Thanks so much for the fantastic giveaway! I'd love to win this for my son. He would love to get it for Christmas. These are so cool! I would love to win this for either of my kids! My son would love this...it goes 10 mph!! I would want it for my daughter since she doesn't have one. I would love to give this to my best friends son who's a little older than my little boy and would enjoy this so much! Because it looks SO NEAT && different! My son would go nuts for this ! My Grand Son has been bugging his Parents for a Scooter and this is perfect for his age! Love to win this for him..Love it! I want this for my son. It is the perfect size for him and I know he would enjoy it. This would be perfect for my oldest son. He wants an electric one like his uncle, this is a much better idea! My son would love the Rockboard Radiate Skateboard!! I like this because it's the perfect size for my son! I would love to win this for my friend son, he would love it! We have the perfect driveway for this, I think next summer my son would be big enough to ride it and he would love it! I love it because it would be easy to store and would be the perfect size for my daughter! I would love to win this for my kids who could use it to have fun and get more exercise outdoors. I love that it's for kids up to 90 lbs. I'd give this to my nephew! I would love to win this for my sons, 4 and 6 this would be great for their size and it is safe! I want this for my niece-- she would love it! I would want this for my nephew. He is a little on the smaller side and this would be perfect for him. I would love to win this for my son because he is amazing and so is this scooter. I love the design. I want this because it's the perfect size for my little nephew, who would be the receiver of this awesome product. I also want this because it gives him a different way to burn off that energy! I want this for my grandchild. I want to see the joy on her face if she gets this. My son has been asking for a scooter and this would be perfect for him. I would love to win this for my son, he has been asking for a scooter all year. I want to win this for my son for Christmas. Who wouldn't want to win this I know my son would love one of these so it would be for him (: Thanks! I would love this for my daughter! It is the perfect size for her. this would be for neighbor kid. good to be outside. My niece loves to be outside riding her bike or just running around playing. This would be so great for her! I want to get this for my husbands grand daughter as a Christmas gift. I would love to win this for my niece, she would love this. My daughter loves her scooter so I think my friends daughter would love this one! This would be for my youngest son. I would love to give it to him b/c he has asked for a scooter for the last year! My son would get such a kick out of this! This would be a great Christmas gift for my very active and athletic daughter. I love this scooter cause it has a break seems safer to me its for son AJ the daredevil !!! I would love to win this for my little grandson. He has a scooter on his wish list this year. I'd love to win this for Christmas. I'd give it to my nephew! 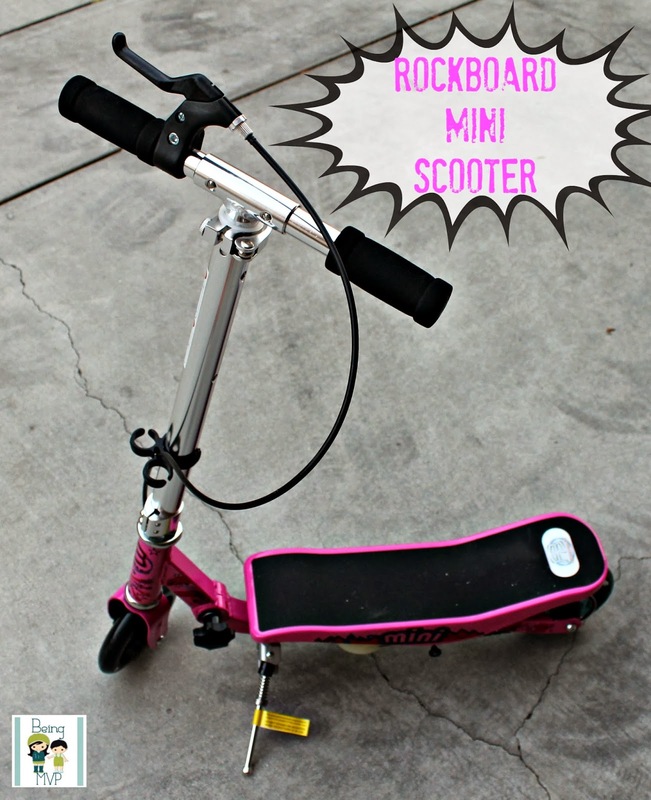 I want to win this because the Rockboard Mini, a smaller-kid version, incorporates revolutionary propulsion technology allowing this scooter to be ridden for hours without ever putting a foot on the ground. This is accomplished without kicking, batteries or gasoline.This is awesome that this scooter can do this! It would be for my genius nephew for Christmas! I would like to win this for my daughter because she likes been active.